Below is a quick update on S&P 500 sectors using the most popularly traded ETFs on US exchanges. 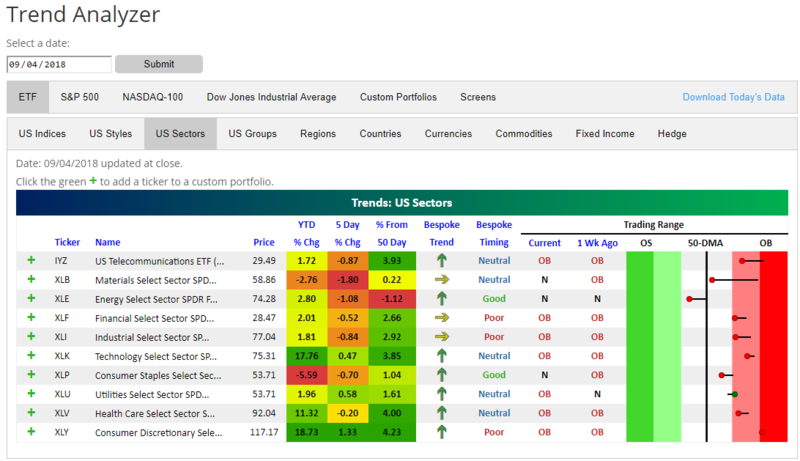 Here we show sectors through our Trend Analyzer tool, which is available to Bespoke Premium and Bespoke Institutional subscribers. We’ve seen some mean reversion over the last week, with seven sectors down and just three up. While all but three sectors remain in overbought territory, every sector except for Utilities has moved lower within its normal trading range. Materials (XLB) has pulled back the most over the last week with a decline of 1.8%, followed by Energy (XLE) at -1.08%. Consumer Discretionary (XLY), Utilities (XLU), and Technology (XLK) are the three sectors that are up over the last week. On a year-to-date basis, Consumer Discretionary and Technology are up by far the most with gains of more than 17%. Materials and Consumer Staples are the only two sectors in the red. Looking at longer-term trends using our proprietary trend algorithm, all sectors are currently either in sideways or uptrends. You can learn more about our proprietary Bespoke Trend and Bespoke Timing rating system at the bottom of our Trend Analyzer page.